Gorkha Janmukti Morcha (GJM) leader Binay Tamang on Monday said the party’s central committed has suspended GJM chief Bimal Gurung, secretary Roshan Giri and 12 others for six months. He added that a majority of central committee leaders have elected him party president and Anit Thapa as general secretary. Gurung, in a letter released to the media later, said the Tamang faction had no authority to make any such decisions. On Monday, some GJM leaders held a meeting at Ghum, near Darjeeling. Tamang claimed it was attended by “43 per cent” members of GJM central committee. “The GJM central committee held a meeting and suspended Gurung, Roshan Giri and 12 others for six months for not doing their duty and remaining absent from the Hills,” Tamang said after the meeting. Gurung condemned the suspensions. “They have no authority to make any such decisions… Whatever they are doing in the name of GJM is illegal and strict legal action will be taken against them,” he claimed. “The suspension is illegal. 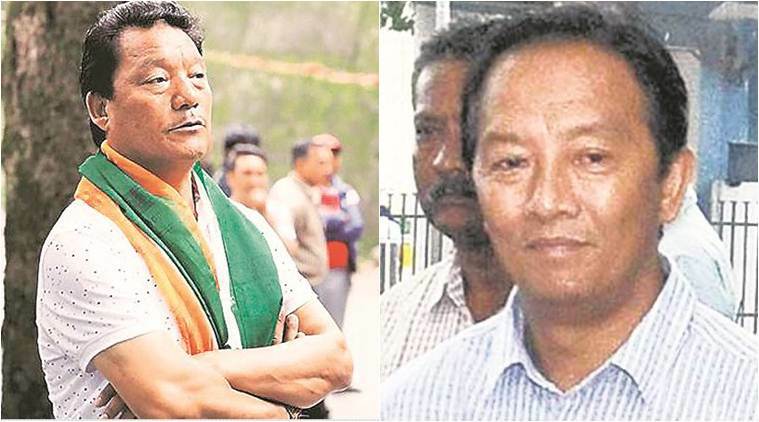 Binay Tamang and Anit Thapa have already been expelled from the party,” said Giri, referring to Gurung expelling the two in September for “anti-party activities”. Though the GJM central committee — which has the right to expel or suspend a member — once had around 93 members, sources said it was unclear how many were part of it now as many had left GJM after the fallout between Tamang and Gurung during the Gorkhaland protests. Gorkha Janmukti Morcha (GJM) leader Binay Tamang on Monday said the party’s central committed has suspended GJM chief Bimal Gurung, secretary Roshan Giri and 12 others for six months.